The drive through the first, second and third old town gates is riddled with distractions…a jumble of shops on either sides and pedestrians flocking the narrow road. But don’t miss the impressive first view of palace fortifications on your left. Sharp breath, soft ‘wow’. The driver calls your attention to an orange-white painted temple complex on the right. The main temple…the hub of town, where all the action is, around which life of the locals revolves. That one? Looks new. But visualize it minus the paint job. The haphazard main thoroughfare continues…street vendors, souvenir shops, small guest houses and little eateries (some signboards in foreign language tempt customers with “Wood in big pizza”). Just 8500 residents, huddled houses, cattle tied to posts, old men squatting on porches, forgotten ancient structures hidden under overgrown vegetation. Uncomplicated. Small enough to be covered on foot within an hour. In the very heart of India. Head down a broader, neater road to Hotel Amar Mahal. Through ornate gates, by a manicured front garden into a pastel painted 19th-century Rajputana style palace…its heritage atmosphere from the word ‘go’. Along formally laid-out Mughal gardens sprinkled with vividly colored rose bushes, wide-tiled corridors with rows of pillars and scalloped arches topped with shapely domes. Till you find a slice of heaven in your spacious luxurious room, decorated lovingly with intricate hand-painted floral motifs. Unless you’re craving an authentic Bundelkhandi lunch spread under a rich Usta-art inspired ceiling in the dining room, floating in the musical mist of a lilting flute. Trust the recommendations of the cheerful and friendly staff and indulge your palate with the distinct flavours of the region. 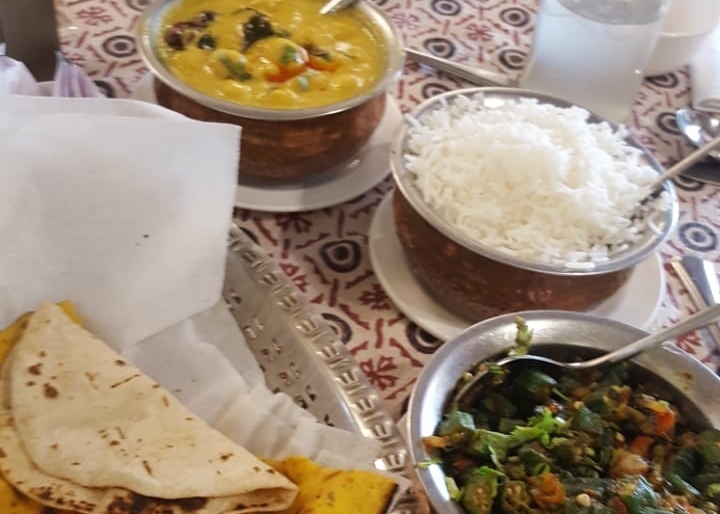 Bundelkhandi chicken, kadhi, missi roti and jeera aloo. The imperatives. First things first. Start with the nerve-centre of the 16th-century capital of the Bundelkhand region. Take a moment to absorb the image of the fort complex from afar. 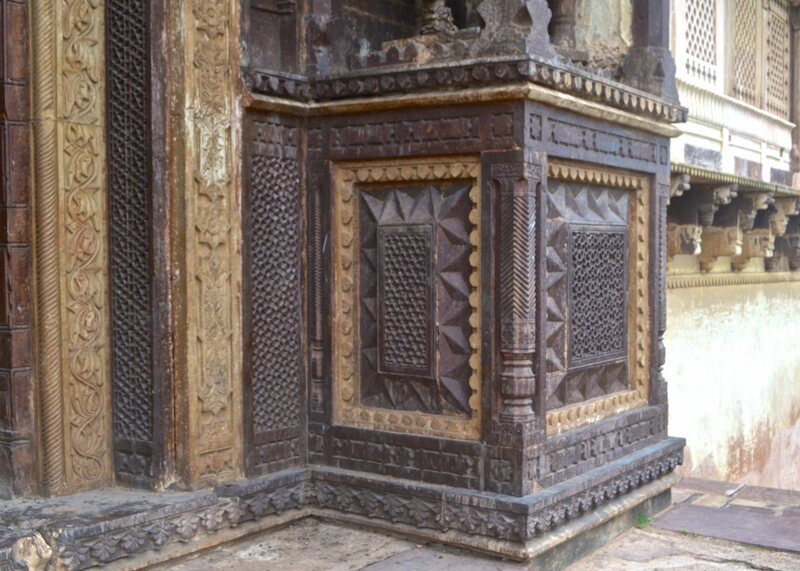 Outlined by a bead-like carved strip of tiny chhatris on the terrace. A one-of-a-kind Bundeli architecture…living proof of three decades of conflicts and alliances with Afghans, Mughals, Marathas and British. Striding over the multi-arched bridge, you wouldn’t realise that the citadel is built strategically on an island. Fascinating double duty of the river…inaccessibility AND divinity. Now chew on this ingenuity of structural engineering. The palaces are positioned to receive sunlit at sunset and shade at sunrise, while the temples get sunlit at the sunrise and shade at sunset! No exaggeration. Get the big picture. Skip the main palaces and off-track to your left from the ticket counter. Poke around the remains of the royal horse stables, ancient step-wells, broken-down mansions, temples, hammams and weapon houses. Stroll along the silent bastions and colossal gates, trace the flow of the fort-walls into the distance. Feel the grace and serenity of the surroundings. 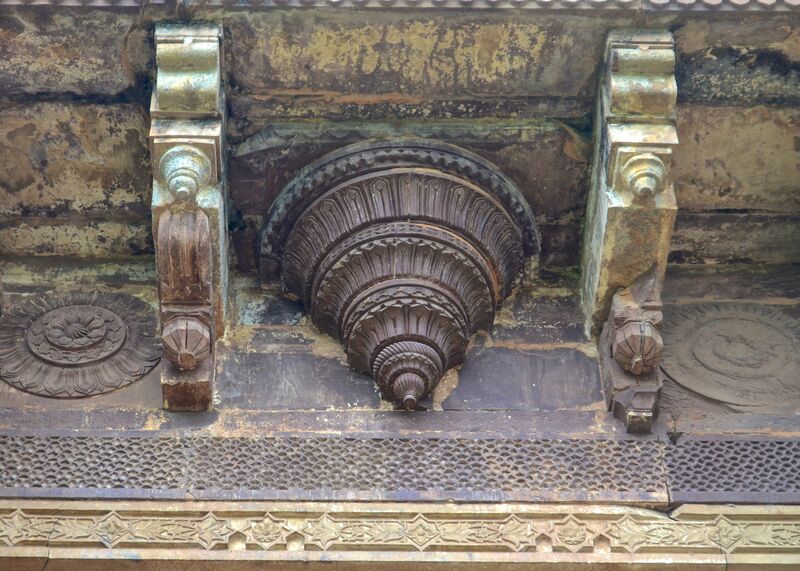 Sense the timelessness of the structure, despite the age of the damaged, ravaged sandstone. Not a soul in sight. Not a flutter of wings in the air. Alone-time. Inhale the royalty! Entering the palace from the Jehangir Mahal side, absorb the details of the grand entrance, ornate window sills, carved elephant brackets and elaborate door. Ponder over the era of ‘kingsize gifts’. Jehangir granted Vir Singh Deo the kingdom of Orchha for his help in defeating Akbar’s armies. Deo reciprocated by building the 120-room Jehangir Mahal in his honour, and Jehangir accepted by staying for one night. Prowl around steep staircases, stroll along lattice-work corridors, peep through windows with vistas and rest in sit-outs under delicate chhatris on the pretty rooftops. Close your eyes and let the breeze ruffle your hair. Hear those ceremonial trumpets? See those bejewelled elephants? Wander into the maze of Raja Mahal, the royal abode of the Bundela Rajputs. Gape at mural-filled rooms, mentally complete the jigsaw of blue tile-work, find patterns in the broken wall ornamentation. Pause under pretty pavilions, stare at projecting balconies and twirl in open courtyards. Be mesmerised by all shades of golden-brown in the town sprawled below…where palaces have morphed into temples, and temple grandeur beats that of royal palaces. Scattered down there are 36 protected monuments and 165 more identified for protection over those six kilometers in Orchha Heritage Zone. And that enigmatic wall disappearing into the tranquil woods! Try taking your eyes off the magnificent Chaturbhuj temple framed immaculately in the elegant balconies and artistic windows. Destination next. Shun all logic as you dive deep into the legend that every Orchha resident swears by. King Mudhukar Shah’s queen Ganeshkunwari, a worshipper of Lord Rama went to Ayodhya and performed severe penance till the Lord appeared as a little boy and accompanied her back. The Lord became an idol and refused to move from her palace. So the palace was converted into Ram Raja Mandir, where Lord Rama is worshipped as King of Orchha till today. Guard of honour, gun salute and all! Potter around the temple complex, sensing the colors, aromas, and sounds of fervour. Stalls are selling milk cake and pedas, souvenirs, pooja items, icons of gods and goddesses, bangles, incense and flowers. Pilgrims are queuing up. Temple bells are pealing, devotees are singing devotional hymns, cymbals are clanging, bards are chanting, sadhus are posing. Spirituality is everywhere. Sway along to the chaos. The adjacent Chaturbhuj Temple, originally intended as the abode of Lord Rama, is the real jewel of the town, even though its not a live temple. Up, close and personal, its even more intriguing. Observe its height, marginally taller than the Raja Mahal Palace. Pine-cone spires, ornamental lotus symbols, painted floral and geometric designs, lovely cornices, balcony projections and 67 steep steps up a large platform. Arcaded openings, a large entrance and a mandapa shaped like a cross! Unique is the word. Linger a while. And finally, seek out the iconic sight that will leave an imprint on you for a long, long time…the Orchha cenotaphs on Kanchan Ghat. 14 multi-level chhatris (memorial monuments) of Bundela Kings, Queens and the royal family built on high, square platforms…over the original sites of cremation. Dated 17th- and 18th-century, these temple-like structures stand solemnly within a gardened complex…and the resemblance to Mughal tomb gardens may not be pure coincidence. The influence is apparent. The pine-cones element again. Pointy spires and flattish ribbed domes. The endangered Indian vultures perched at inconvenient angles, almost chameleon-like, blending in with the colour of the stone. And nearer the Ghats, the lone chhatri of Birsing Deo’s making a statement. Especially with the grass sprouting on its crown! Its a wonder what a change in perspective can do. Soak in the beauty of the cenotaphs from the boulder-strewn edge of the placid Betwa. Crossing the narrow bridge, dodging vehicles, discover several photo-spots. In the darkening colours of the sky, the mysterious silhouettes of the cenotaphs darkens and their shadows play on the glassy surface of the water. Splashes of green from trees and specks of orange from bathing sadhus deepen the allure of the modest brown assembly. Orchha has worked its magic and you’re under its spell. The gracious hospitality of Amar Mahal enhanced our experience in Orchha. All opinions in this post are my own. Next How to experience Prague with and without the crazy crowds? Thanks so much! Have you been to Orchha? Never before but I am planning to visit soon to cover more places around. 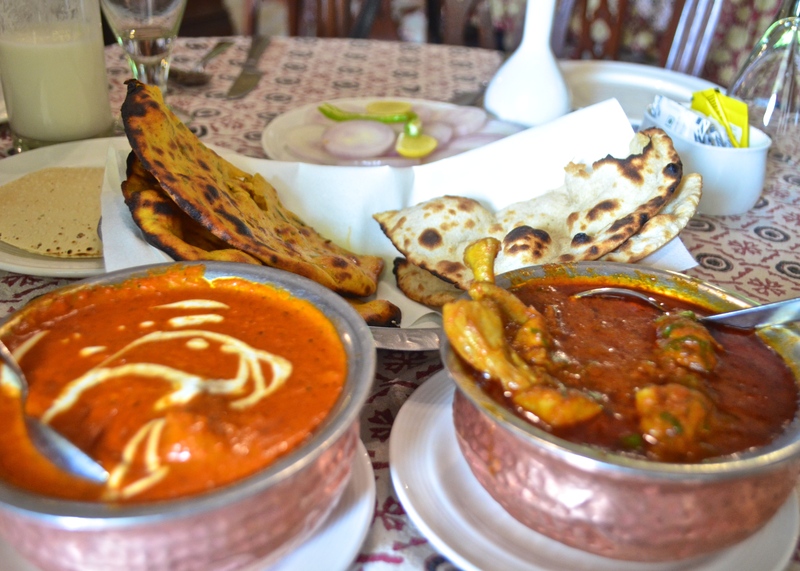 Can you share other budget places to stay around apart from Amar Mahal as it seems bit costly for me. Also share the near by places I can explore to spend atleast 3 days there. I just visited Orchha through your words and photographs. Mahn, how much did I enjoy the place! Your comment warmed my heart! Thanks so much, Hariom! You have captured the essence of Orchha beautifully Puneeta! I have been there long time back. I did not spend enough time so seeing you post reminds me that I should revisit and give the place a little more time 🙂 Is the river clean now? Thanks for your generous comment! Yes, a revisit may be in order, especially if you have not been to the other side of Kanchan Ghat for an iconic spectacle last time 🙂 The river was clean, yes. Wow Orcha sounds like such an amazing place to visit! So much beautiful architecture to explore and there’s clearly so much history there. Looks like I need to add Orcha to my bucket list! The region overflows with ancient history. I love where you said “Sway along to the chaos”. I feel like that is my life most days! Your photos are beautiful especially the one with the orange flowers in the foreground. The cenotaphs and the Mughal gardens are what I would enjoy most of the “orchha”! One has to be mindful of sifting relevant from irrelevant, while travelling in India. Orchha is a case in point. India is filled with so much beauty and history that I find fascinating. I have never heard of the Orchha Heritage Zone, but it’s exactly the kind of place that I love to visit. I like the idea of wandering off the main route as well. It often gives you an entirely different perspective. Thanks for taking me there! Orcha sounds like a hidden jewel. I love how open all of the shots are. Free from the hordes of tourists with selfie sticks, but still impressive and enduring sites. WOw, this is stunning and impressive…I actually have never heard of this amazing place and area and have it on my bucketlist whenever I get to finally visit India. Love the visuals and tour – it was wonderful! It is an astonishing little gem, true. I am blown away by how pretty those Cenotaphs are. Such beautiful and intricate architecture, and unlike most of the photos you see of India being an overpopulated and polluted place, this area was lush, green and clean with sparse population. If I went anywhere in India I would certainly put this place on my list. The architecture is the main draw in Orchha but we found lush nature everywhere too. There are vast areas in India which are quiet and serene. I really felt the crazy drive to get in through the many gates to the city of Orchha. We loved to find Mughal buildings as we travelled through India. Your hotel definitely looked like a luxurious spot to explore from. The palace reminded me a bit of the Red Fort in Agra. You painted such a picture as you wandered. This is certainly somewhere I would like to visit if I return to India. The Mughal buildings in India are certainly fabulous. Orchha, though. has some very unique Bundeli architecture. Hope you come back ad discover more..
Wooooow, this place is amazing. And it doesn’t look crowded at all. Question, palaces built for sunlit at sunset and shade at sunrise makes a lot of sense but why it flipped for the temples? The palace looks beautiful! 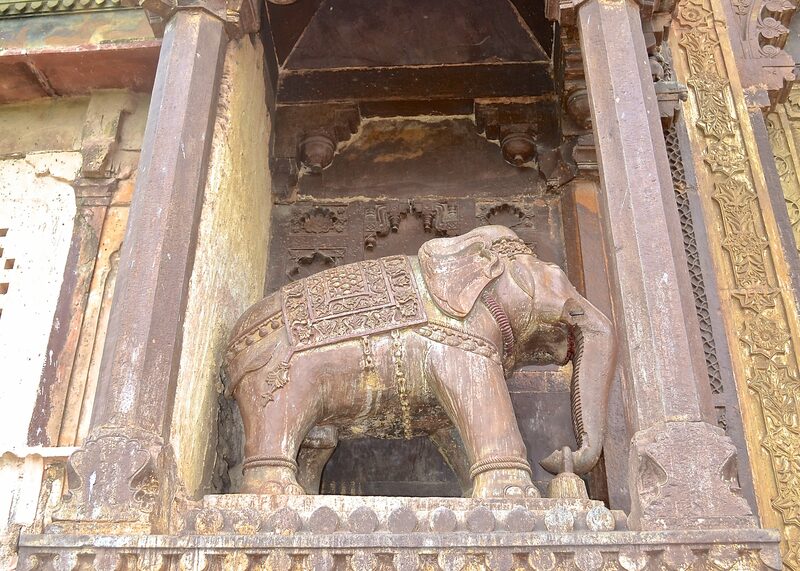 I love the carvings of the elephants. It always makes me smile when I see funny signs in English – I’m not sure I would fancy big wood in pizza – the Bundelkhandi lunch looks much more appetizing! The Bundelkhandi lunch was superlative. Of course, its always a better idea to taste local cuisine. The beauty of orchha is stunning with your words.Love the captures and monsoon seems good time to visit here. would love visit here soon. Thanks so much, Mayuri. Monsoon is perfect yes…you just have to prepared for humidity with breathable clothes. Thank you for introducing me to this lovely town of Orchha. The architecture looks beautiful, and the food – amazing! The Raj Mahal is quite a historical wonder – I would love to wander around its grounds and see the protected monuments. Your photos are beautiful! Thanks so much, Claudia! Orchha is a town still trapped in the past and the vibes of temples towns are always unique. I’ve never heard of Orchha so this was a very informative and interesting read. The Orchha cenotaphs on Kanchan Ghat looks and sounds so grand! I always wonder what it must have been like when building such fascinating structures like this. The cenotaphs are just magic! What a beautiful place. So much intricate detailing. I’ve only visited parts of the golden triangle and Chennai. Would love to go back and explore some lesser known places like this. There’s so much heritage and history in every inch of India, its unbelievable. Hotel Amar Mahal looks really beautiful—the details, colors and walkways all look so intriguing. I love the architecture of the whole area, too. Everything is so pretty, especially Chaturbhuj Temple! Orchha looks like a wonderful town, and the history sound fantastic too—I’d love to visit sometime! Thanks for sharing such a neat place! The Chaturbhuj Temple was my fave too, aside from the Cenotaphs. You could club Orchha with a trip to Khajuraho, in case you make a trip. Orchha looks like a wonderful place to visit. I just love the history here, the various cultural influences over the years, it really fascinates me. The details in the buildings too and just incredible. Orchha is not a typical tourist destination, but it has risen in popularity during the last decade. 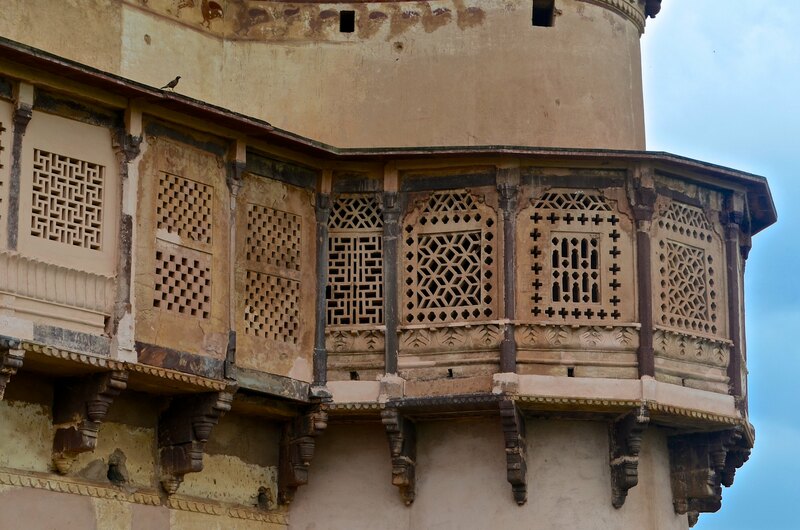 Orchha is stunning, no doubt, and the monsoon greenery seems to accentuate the ochre of the haveli walls. The palaces are grand; the architecture is amazing. From your photos, the structures look like they have been well restored. Monsoon was heavenly, because of the vibrant colors and the browns of the monuments stood out even more! Orchha looks like an amazing, vibrant, magnificent place. I love the “translation fail” found around the world with stores and restaurants trying to entice tourists in English, but not quite getting the job done — Wood in big pizza. 😉 Soooo, you can order wood that is served in a really big pizza then? Yummy. Or do they mean pizza made in a wood-fired oven. I am suspecting the latter. Your suspicion is correct 🙂 Translation errors are quite charming, I agree! Orchha is magical, specially at sun down. Wow! Orchha looks amazing! And huge! How long did it take you to explore the whole thing?? We were there for a weekend, (including 5-hour train journey both ways) and our two days were quite full. India has so much history. It looks like Orchha seems like a great place to dive deep into some of that history. Absolutely! Try to go when it’s not too hot. Thanks Melody…yes, the food is a big part of the overall experience. Orchha has always been on my list but have been unable to explore till now. Where didn’t you stay here here? Did you include other places in MP with this trip? We stayed at Amar Palace, its a lovely luxurious accommodation. It was just Orchha over the weekend.